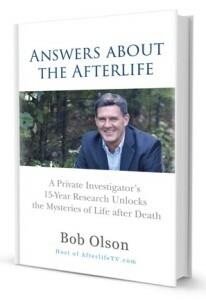 Bob Olson: “In 2012, I created this video about “what happens to people who take their own life in the afterlife.” While I had not yet written my book, Answers About The Afterlife, and Afterlife TV was only a few months old, my conclusions about this important subject have sustained since 2012 (although I will admit that my book does an even better job explaining this subject than this video). This episode covers a wide range of subjects, including: soul pre-birth planning, the soul’s perspective on our choices & actions, spirit vs soul, life reviews, soul support from masters and elders, and a very important discussion about the ‘potentials’ our souls choose for us in life. “Over 250,000 people have seen this episode, most of whom have lost a loved one to suicide. And thousands of these people have sent me thank you emails and comments because of the comfort it has given them. This is how understanding the afterlife can benefit us. I highly recommend that you watch this episode even if you have not lost a loved one to suicide, because what you will learn from understanding this subject will help you understand life after death on a very deep level. Bob Olson talks about suicide and the afterlife. Or visit http://www.AnswersAboutTheAfterlife.com to read the first chapter of Bob’s book. Bob Olson’s websites are linked below. You can also listen to the audio-only podcast of this and every Afterlife TV episode at the bottom of this and every post (or as an iTunes podcast). As a husband of a medium, I know she comes across this situation quite often. It is a relief to her clients, after proving proof of continuity of life, that their loved ones are okay and still are alive in the spirit realm and are watching over the family and friends. Everyone has their on way of dealing with this emotional experience, yet the ‘big’ picture is often lost. Your statements are on target and well presented in a way that is loving and profound. Thanks. I appreciate your comments. Say hello to Lynn who is on my directory. You’re most welcome. I’m glad. I’ve wondered about that – if some suicides were pre-planned before birth for the benefit of learning and/or experiencing its impact on everyone involved. It never made sense to me that one would be ‘punished’ for it given that anyone who commits suicide is, at the very least, in some measure of pain and not seeing things clearly. I also believe we’re here to experience physical life and the infinite choices we have before us – causing the expansion of consciousness- the universe- God. Thank you, Bob for these wise and comforting thoughts on the topic of suicide. I am a big fan of your show and was particularly drawn to this episode. My brother committed suicide in February. We were very close and my heart was broken in a unique way – it’s a deep soul lesson, for sure. I took solace in this episode and wanted to thank you. Such a tough subject. So sorry for your brother’s passing. Thanks for writing. I’m glad it was helpful. I’ve read your book – I’ve watched at least 10 of the interviews on afterlife and I found your website when a friend of mine made an appointment for me with a medium after my husband died by shockingly died by suicide. 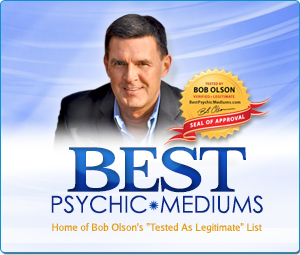 I found the medium on your Best Psychics web site. She – Jennifer Farmer – was great. I will share this video with some of my fellow survivors. Thank you for all your work and insight. It has put me on the track to find my own answers about the Afterlife. Thank you. Very sorry for your husband’s passing. Yes, Jennifer is wonderful, so I’m glad that worked out so well for you. Thanks for sharing. Thank you fior addressing this sensitive subject. I am grateful that you share your own personal struggle with depression and thoughts of suicide. I am trained as a suicide prevention counseler, as well as, as a psychic/ medium. Clients come to me with these feelings and I now have this episode as a tool to share with my clients that have suffered with these feelings or the loss of a loved one due to suicide. You’re very kind. I did not realize you were a trained suicide prevention counselor. That’s wonderful. I’m glad you have this to share. As always, I appreciate you as a friend and a psychic/medium. I also appreciated to see this video. I lost my long term partner in June – the circumstances surrounding his unnatural death are not clear and still being investigated. So many unanswered questions and such an endless amount of pain and collateral damage. I would really like to see a medium but live in Germany. Do you have any recommedations for Germany and in particular Berlin? Thanks so much for any informaton. First, I’m very sorry for your loss. Suicide is quite a challenge for those left behind, so I hope some of your questions get answered. As for your question about a medium in Germany, I have one person–Karleen–who I have not personally had a reading with but she did pass my very difficult screening process & she has some great reviews: http://www.bestpsychicdirectory.com/canada/Karleen-Savariau-l3218.html She is from Canada but is currently living in Munich. I wish you the best in your journey of grief and spiritual understanding. Thank you for finding this out for me. I will look into it or a telephone reading. I hope it helps. Thanks for your information site and videos, they help. Thank you so much. This was very helpful to me. I just lost my son to suicide two days ago . He was suffering from schizophrenia and survived previous attempts and this was unexpected. I am still working through it and needed some reassurance that he would be ok – and you have done that for me. I am so grateful. I still need to comfort some people who were there but I am not so worried about my son after listening to your broadcast. Could you recommend any medium in Houston, Texas? My boyfriend committed suicide. He came back 6 no later. I felt him sit on my bed run his hand down leg. Whemy daughter said there was a big bright glow around me.I believe he took me to heaven. To show me how how he made it. That he is ok . that there is life after death.it’s been 10 yrs. I still miss him. That’s amazing. Children have stronger abilities that adults, so that doesn’t surprise me. Thank you for sharing that wonderful gift he gave you. I just got through reading about Suicide and the Afterlife. It was insightful and thought provoking. We all want to know that our loved ones who have committed suicide are not in hell. You’re not supposed to take your life but I can’t understand why one act of desperation would condemn a soul to a place like hell. These people are already at the end and they should be comforted and loved on the other side. Thanks Bob, it was comforting to read. I’m glad you came across this. I also write about it in my Answers About The Afterlife book with a little more detail. Amazing that over 300,000 people have watched this video. I’m sorry to hear about your friend and his wife. Very sad indeed. I appreciate your kind comment.